Aside from overworking myself to a migraine, last week's holiday was pretty good. I met with Lucy twice, once she came over for a hot chocolate and a chat, and the second time we went out to Puzzlewood in the Forest of Dean and then out to dinner. 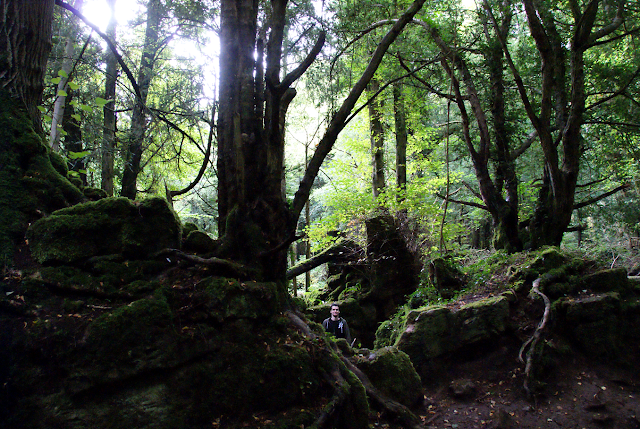 Puzzlewood was great. Supposedly it's where Tolkien based the Shire, but it's easy to say that. Though it was where they filmed the weeping angels of Doctor Who, a few episodes of Merlin and Atlantis, and it's generally a gorgeous place. I was worried that the place was going to be small and disappointing because the only pictures you ever see of the place are of just three or four very specific locations. I thought the rest of the place might be rubbish. Wrong! It was beautiful, so dense and tangled, it was amazing. It even rained while we were there, really quite hard, but we knew that before setting out and it was subsequently very quiet there because of it. The rain only started when we were half way through the forest, but being under such dense trees we were relatively untouched. It was amazing, even when we did get wet, and because the ground is so uneven the rain pools and creates streams along the paths. But the three of us agreed that it wouldn't have been half as good if it had been dry. It was quiet, it was wet, and it was a great adventure. Seeg's excellent photo-bombing skills; I only noticed him stood there after looking back through the pictures. I also did a little more cooking. I already showed you my Japanese cotton cheesecake, which I made a second time and just as perfectly when my parents came back, and it tasted divine! I was so proud of myself! 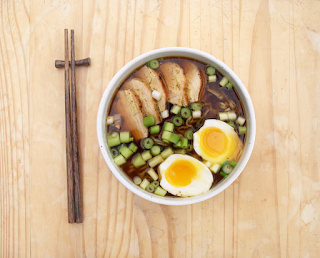 But I also made us chicken ramen, which was filling and awesome, and teriyaki chicken which was amazing. I'm making it again this week. And Seeg and I had a lovely at-home dinner date with duck and Oceans Eleven, because we're cool like that, and a dessert of brownies and chocolate ice cream which just can't be beaten. I had wanted to do some crafting - I had three projects I was preparing for and they just didn't happen. I ended up playing WoW and working on my book for the most part, to be honest, planning out the next story. I even wrote a short 5-page story for my main character, which is a habit I think I'd like to make a habit. By writing a short story for most of the important characters I can set them in stone and get to know them a little before I start writing the book itself, and it also gives me the opportunity to flesh out an event from their past, something important like whatever might drive them, or something lesser but still important to the character like when they met someone who becomes very important to them. I started with my main character, and he's not quite what I expected, but I'm very fond of him and his terrible ability (or lack thereof) for naming things. I admit that names are my weak point, but his skill is just awful. And I love it. The Taken King just came out for Destiny, too - Seeg was not impressed because Lucy and I had made plans for that day because I'd completely forgotten, but he came with us and had fun anyway, wearing his Destiny hunter hoodie to remind me of his sacrifice, no doubt. I did keep telling him he didn't have to come, but I'm glad he did. If he hadn't both Lucy and I would have ended up in the mud many times. Though he did have to put up with us singing Taylor Swift in the car on the way back. I want to dislike her, I do, but I can't help how catchy her songs are, they get ingrained into your head and you need a lobotomy to get them out! But I've been watching Seeg play that while I've been brain-storming and the changes they've made are good, and though we were both sceptical about Nolan North replacing Peter Dinklage as the ghost, he's actually great. "I wonder if Ikora gives hugs to ghosts. Ehheeeeh... Anyway, good work." And I also rewatched Sherlock. If anyone wants to know what I want for Christmas, it is for the BBC to get season 4 done and finished because they can't leave it on a cliff-hanger like that for two years.